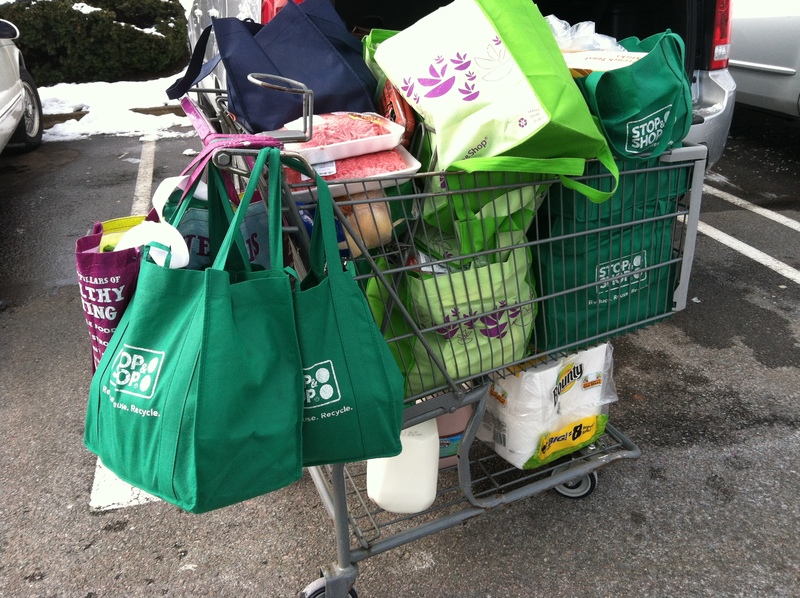 Feeding a family of six — thank God for coupons! When I started having kids, I was always struck by how expensive they were — nonstop diapers (there were periods when I had as many as three in diapers at a time), wipes, food, clothes, books, crayons, toys, on and on, never-ending. We got some help with the last two, thanks to very generous family members and the fact that my parents live a town with a Carter’s outlet store. I had a lot of kids, and they needed stuff. Cha-ching! But I had absolutely no idea how expensive they’d get as they got older — particularly when it came to food. In the last year, it seems they can’t get enough to eat. (Hello, growth spurts!) I find myself at the grocery store two or three times a week to replenish our supplies, lest one of my children clutches his tummy and falls to the floor in a dead faint. And they’re not even teenagers yet. File under: the real reason I need to go back to work. 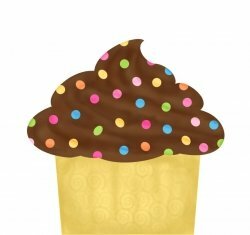 You can have my cupcake when you pry it from my cold, dead hand…. Well, it’s about time we did something about the pervasive health hazard that has taken over our schools — the evil birthday cupcake. This long-overdue action was taken locally by the wise leaders of schools in Mansfield, Mass., (here’s the Boston Globe story), saving hundreds of kids in that town from the ravages of butter, chocolate, and sugary frosting. School officials cite the alarming rise in childhood obesity and a spike in food allergies as support for their decision. And they’re not alone — many districts in Massachusetts and other states have started a serious crackdown on sweets. Whew. Now I won’t feel like such a dork when I hand my kids a slice of watermelon with a candle in it for their birthdays, as Janice King, president of our state’s School Nutrition Association, has suggested be a better option. Except, I can’t, at least not for my oldest child. She’s diabetic. All those fruit sugar carbs are a big no-no for her. Sorry, Janice. How about a nice bowl of spinach? The funny thing is, the school cafeterias probably are a bigger contributor to the poor diet of our kids than the occasional birthday treat. I know. I get a monthly printout of each lunch — every component broken down to grams of protein, fat, carbs, calories, etc. — in case Mitzi wants to buy lunch one day. Sure, there are choices that are better than others — an iceberg lettuce salad, for instance — but really. Are your third graders choosing that over chicken nuggets? I understand the issue of food allergies, sure. It’s terrifying to know that there are foods out there that could make your kid sick — possibly kill her, if not handled immediately. I get that. Because diabetes is a little like that — without taking insulin, any carb, be it sugar or flour, fruit or cracker , can cause my kid harm. It won’t kill her, you say? Well, she spent three days in intensive care last year with blood sugar so high it almost killed her. As a parent, it’s my job to make sure that she doesn’t eat what she’s not supposed to. It’s my job to teach her the rules, enforcing them, working with other adults around her to ensure her health and safety. But I have never, ever told another parent that HER kid couldn’t have a lollipop or candy cane just because it’s a danger to my kid. Perhaps if I lived in Mansfield, parenting a kid with food concerns would be easier. As for the other argument — the one about our kids being fatter than ever — maybe the school committee in towns like Mansfield should reinstate daily gym classes instead. Calories in, calories out. You eat, you move. If you move less than you eat, you get fat. When kids have virtually no time during the day to run around, they are likely to put on weight. It’s that simple. It’s not the birthday cupcake once a month that’s doing it, folks. Oh, Jen, I hear you say, the kids have all that time after school to run around and get exercise. Well, you might be right. They might have that kind of time — if they don’t have to go to after school care because they have parents who work. Or if they can find time after the hours of homework they get. Or if they among the very few children who can play freely in their yards and neighborhoods, riding bikes and building forts and shooting hoops and skipping rope. Aha! How about, before singing Happy Birthday, we have the class do fifty pushups? Every day well-meaning adults do what they can to protect kids from harm, real or perceived. And we should — we’re the grownups, after all. But we’re going about it the wrong way. Simply eliminating access to something is not going to teach your child anything about making choices. It’s a very big world out there, and unless you plan on accompanying your child for every second of it, she is surely going to face a conflict and have to make a choice on her own. How will she know what to do, if she’s never done it before? As for birthday cupcakes, well, I’ll keep baking them and serving them. Some kids, like my own daughter, won’t be able to indulge. But that doesn’t mean her brother or sisters can’t — or the other kids in the world. For my daughter, I’ll make something else. And don’t worry — at our family parties, I always offer fruit salad. And I’ll make sure to run the kids ragged to make sure the cupcake won’t tip your bathroom scale. As for the grownups and your celebratory indulgences? I’m afraid you’re on your own for that one. No one’s banning truffles and champagne. Yum! 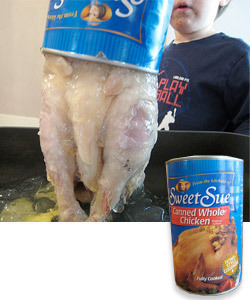 Chicken in a can! Yes. More frightening food information. Here’s a list of 10 Foods To Never, Ever Let Your Kids Eat, courtesy of momlogic…. Don’t ask me where I’ve been. I can’t remember. For the last month I’ve been struggling with just about every aspect of my life, juggling, balancing, trying to fit together all the pieces of this jigsaw puzzle that is my life. And, mostly, I’ve been attending a dark, brooding, pity-party as I hopelessly criticize myself for being less-than in most of the things I’m trying to do. When I try to be a good writer, my parenting falls short. When I try to be a good parent, my writing goes to the back burner. When I try to keep up with the daily minutae of laundry, dishes, holidays, and housecleaning, my husband waves at me from a distance and I’m reminded that I used to date that guy and he might be still interested in my attention every now and again. So I haven’t been blogging. Mostly because I’m often sick of listening to my own thoughts, I don’t feel like I have much to share with anyone else. I’m back on the upswing. I’ve submitted a number of pieces in a range of genres, and hope that at least one generates a positive answer. I cleaned the house once or twice. My parents came from out of state for a short but joyful visit. I had some teacher conferences and my kids are doing very well in school. I can fit into my old jeans. And despite the ever-present financial concerns, we still have a house and food on the table, even if it is usually pasta with butter and cheese. Part of the problem is that I hold myself to very high standards. Oh, sure, I could log on daily and blather on about this or that, but it’s just not in me. Somehow I have to make everything I write here “column worthy” — that is, if I wouldn’t have sent it to my old Herald editor, it’s not good enough to publish here. A crisp, pithy 500 words on something meaningful, whether personal or global. Precise language, whether poetic or staccato; an identifiable arc with personal insights and external meanings intertwined. A bit of me, exposed, for the general masses to critique. Not too daunting, is it? No wonder my fingers freeze over the keyboard every time I log on here. In my fiction writing I have defrosted myself by accepting that I am free to write the biggest pile of crap that I can, because all writers know that the real stuff comes in revision (even while we hope that as we struggle with the first draft it’s not all entirely a load of poo). The same is true for my life. While I haven’t lowered my standards or truncated my expectations, I think I’m going to make a bigger commitment to myself and to this blog. My world is messy and complicated. Why should this piece of it be any different? A Mom’s World continues to spin. Hang on. There is no better food in the world than Sunday gravy. Before I tell you why, let me clear up a few things. There’s a lot of debate about what to call tomatoes cooked to serve over pasta. Is it sauce? Gravy? Something else? I won’t tell you that you’re right or wrong, whatever you think, but in my world here’s how it breaks down: Tomatoes cooked with Italian spices and served over pasta is marinara (I think adding “sauce” to “marinara” is just redundant). When you add meatballs, sausage and a stick of pepperoni, that’s gravy. There are, of course, plenty of sauces — clam sauce (white or red), cream sauce (any variety), and many others. But gravy is what we had on Sundays. And, apropos of the day, it was heavenly. For many people, Sunday was — and is — family day. Playtime with friends is limited, which is to say your backyard is where you play with your friends who had different schedules. In some areas, Sunday is a visiting day, though when I was young my extended family lived too far away for a day trip. Sunday gravy. I don’t know when Mom made her meatballs, only that they were made in advance, as she is a proponent of chilling them before cooking (this helps them to not fall apart when frying). On Sundays, we’d wake to the glorious smell of frying meat, the air thick with garlic and onions and basil. We’d all head off to Sunday school and mass, and when we came home around noon, a thick gravy was already simmering. I don’t know how she did it, since she also taught Sunday school classes and drove us around. Another of Mom’s brand of magic. The gravy needed to be ready because our Italian family’s tradition was to have a midday dinner, around 2 or 3 o’clock. I guess we had a light supper or snack later before bed — I remember a lot of PB&J crackers while watching the Disney movie that showed weekly at 7 p.m. — but gravy was the main meal every Sunday. After putting on play clothes, you’d wander through the kitchen as much as possible, eyeing the heavy pot. Whenever you dared, you’d grab a slice of bread (white, not wheat in those days, and this makes a huge difference in taste), slather on some gravy, and dig in. Mostly, Mom would yell that it wasn’t ready yet, but it was. Gravy bread is unparalleled in its deliciousness. Sweet and spicy, and on a lucky occasion with a few pieces of meatball…you’d try to wait for it to cool but that was too hard. Who cared about burning your tongue, anyway? When Mom put the water up to boil, Dad would get the unwieldy cheese grater out. This mammoth device clamped to the side of the countertop, reassembled with every use. A block of parmesan was cut and a lucky kid got to crank the handle. Said lucky kid also got to snack on the sharp, pungent cheese while doing the job. The six of us gathered for dinner, possibly with a good friend, or, later, the lucky boyfriend or girlfriend who had achieved that special level of acceptance (everyone was welcome for Friday night pizza, but only a chosen few made the cut on Sundays). Thick, fresh bread and an amazing salad rounded out the meal. Dad served us heaping portions — and when it came time, offered seconds, which we called a “Grandpa spoonful”, which was a heaping ladle of macaroni, far more than you could ever eat, but Grandpa and Dad seemed to agree that all of us needed to be fattened up. Have another meatball! More sausage? Another pause. We called it macaroni. I still do, though most of the world refers to it as “pasta,” something I’m still getting used to. This meal a tradition that I am trying to continue. Ray and the kids love my cooking, though I am partial to my mother’s gravy and meatballs. I leave out the pepperoni, though, as it gives me agita (which you know as heartburn). My brother Stephen also cooks a gravy on Sundays. Harry and his family do from time to time. Michelle joins in. The kids help me make meatballs and they wander through the kitchen, sniffing eagerly as the gravy simmers. We crowd around the tiny kitchen table, bumping elbows and knees, and dig in. Family time over Sunday gravy. Gravy. “Sauce” is far too ordinary for this kind of meal. We’re at that side of the food cycle — little is left in the refrigerator, grocery shopping day is next week. Luckily, the kids love peanut butter and jelly sandwiches. I can see them as a prominent menu item for the next few days. I’ve noticed, though, that lots of folks seem sorta against the old PB&J. Allergies aside, why? Okay, there can be a lot of sugar in the sandwich, sure, but choose the right brands and it’s natural sugar. We buy all-fruit instead of regular jelly, whole wheat bread instead of white (my kids rarely get white, so when they do it’s like a party, bread ball-rolling and all). It seems like a pretty healthy thing to eat. I mean, it’s not bologna. I just read a blurb on another blog by someone whose company has organic, all-natural food choices (via recipes or an actual store) for parents who are sick of “feeding their kids the usual mac & cheese, PB&J, and hot dogs”. But it was phrased in a way that made those things somehow, I don’t know, poisonous, and parents who chose those items deserved a visit from the department of social services. Um. My aunt makes an awesome mac & cheese, and while I’m sure that the fat content isn’t the lowest in the world, it’s not bad-for-you food. Turkey dogs are also a quick, healthy meal. I’m getting very tired of people who think they know better than I do what to feed my kids. Okay, we all know that kids should be eating a grilled chicken salad with a balsamic vinaigrette on the side every day for lunch. And dinner. Low fat, high fiber, organic ingredients. But some of us live in the real world where sometimes a budget doesn’t allow for the best food choices. I’m glad my kids will eat grilled salmon, wild rice and salad — I just can’t always afford to serve it to a family of six. And a PB&J is just the thing during those times. To the food nazis, well, stop picking on the most popular sandwich in the world, and pull up a chair. If you’re good I’ll give you some blue corn tortilla chips. ‘Cause I’m that kind of mom. I don’t fight with my kids about food any more. I used to, until pretty recently. Back then, I’d get upset that no one but Cooper would try anything new, that everything had to be dipped in ketchup, that cucumbers and frozen corn were the only vegetables palatable to the girls. I stuck to a pretty boring routine of cooking what they’d eat (pasta and corn, pasta and cucumbers, pasta and chicken nuggets, pasta and ketchup). Ray and I ate a lot of frozen food or leftovers from the few adult-friendly meals I threw together. At some point, I decided I was getting shafted. I like food. I like to eat (with guilt, to be sure, but I like to eat good food, whatever the calorie count). Why did I have to suffer just because my kids were, well, kids? Plus, dinner time was agonizing for us all. I’d cajole, threaten, beg, bribe — whatever it took to get a “decent” meal into the quartet. I planned meals that they could help cook. The love to cook, but preparing it didn’t change their opinion that new food is bad food. My anxiety increased as the control I never had slipped through my fingers. Clearly things had to change. I didn’t want to cook two meals every day (as easygoing as Ray is about getting fed, I sensed he was getting restless at yet another night of frozen pizza). I wanted my kids to eat well and enthusiastically — that is, to be culinary explorers. Okay, I watch a lot of Top Chef. But I also needed to ease up on my need to control. Here are things you can’t ever do for your kids — poop, sleep and eat. My stress was never going to change that truth. So I started cooking for the family. Like it or lump it. Don’t like it today, you’ll like it tomorrow. At first, some kids ate a frighteningly small amount. I worried about slow starvation, vitamin deficiencies, loss of teeth and hair. But eventually, over many painful months of holding my breath and throwing an embarrassing amount of picked-over food away, night after night of biting my tongue and/or counting to ten to relieve the frustration threatening to boil over, the strangest thing happened. Just as my mom said they would, just like I did when I was little, my fussy kids started eating what I cooked. They didn’t eat everything all at once. They still don’t. But every dinner they each taste something new, sometimes liking it, sometimes lumping it. One meal, for all of us, a meal we all could eat and enjoy. Healthy meals (usually) with vegetables, whole grains and a little something sweet. I do try to serve at least one thing they each like — a pasta, a rice, raw peppers and tomatoes — and accept that I can’t make everyone happy all the time. Thus, my greatest flaw revealed, exposed in my kitchen, but true everywhere else I live. No, Jennifer, you cannot please everyone all the time. Get over yourself and stop trying, whether it’s feeding your kids or participating in the town discussion about all-day kindergarten. Some people will not like me or what I say or do. Sigh. I know, I know. Sometimes I just can’t help wanting them to. Mitzi, my toughest food critic, said that, while it wasn’t her favorite, she’d eat this meal again (see below). That, my friends, is a rave review. Not that rave reviews, ahem, matter. Not to this well-adjusted Mommy.